Epson isn't one of the biggest players in the digital camera market, but it's developed the groundbreaking R-D1 digital rangefinder and it produces the neat P-2000 portable hard drive/image viewer, with a 40GB capacity hard disk and 3.8- inch Photo Fine display screen. This Photo Fine technology has found its way into the L-500V. In most respects, this is an ordinary 5-megapixel compact snapshot camera, but on the back there's one of the largest LCD displays you'll find on any digital camera. What sets this LCD apart is not only its size, measuring 2.5 inches across the diagonal, but also its ultra-high resolution. As Epson claims, it's the world's highest-definition consumer display on the market. With a resolution of 256 pixels per inch, it displays supersharp images both in playback mode and while shooting. 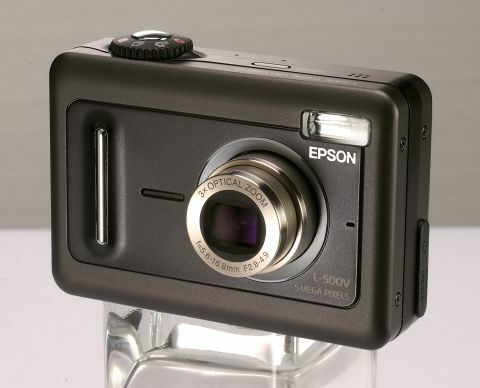 Epson boasts that this combines the benefits of two products in one: a digital camera and a high definition photo viewer. While its playback quality might justify this claim, its storage capacity doesn't. It uses SD cards, but only it comes with a 16MB card that lacks the capacity for serious shooting. It's worth bearing in mind that you'll need to budget around £100 if you want one of the latest highcapacity 1GB SD cards, which will enable you to keep several hundred shots stored in your camera, ready for playback. The display also has a special Outdoor mode, activated by the joystick on the back of the camera, to make it brighter and more visible in daylight. It works well, and it's a useful feature on this camera because it doesn't have an optical viewfinder. Other features of note are the 640 x 320 30fps movie mode, and the Print Image Framer option, which enables you to add decorative borders to your photos. In every other respect, this camera is very much like any one of a host of basic snapshot models. There's a 3x optical zoom, an autoeverything program AE exposure mode and a small selection of scene modes (Landscape, Portrait, Night View and Night Portrait) for specific sets of conditions. You can use the main mode dial to switch between Setup, Playback, Auto, Manual, Continuous Shooting and Movie modes. Don't get too excited about that Manual mode, though, because all this does is enable you to apply white balance, EV compensation, ISO and other adjustments. In Full Auto mode, you can still operate the joystick controls, but the menu system is unavailable. The joystick works better than most of its type. The top surface has a rubberised grip so your thumb doesn't tend to slide off, and the movement is pretty positive, too, with minimal 'slop'. Press up to toggle the outdoor LCD display mode, left to switch between flash modes, down for the self-timer and right for Macro mode. Most users are likely to want to stick to the Manual mode. When you press the menu button, you can switch scene modes, change resolution and quality and as mentioned earlier, adjust EV compensation, WB and ISO. Using the menus for these options - especially the last three - is a bit of a fiddle, and what makes it worse is the tiny delay in response between the joystick and the menus. On the other hand, it does mean that this camera is at least very simple to understand, and you'll know exactly where every control's located in a short space of time. The Epson's excellent display quality, simple controls and solid, well-finished build leave a very favourable impression. Picture quality, though, is no better than average for a low-cost compact camera. Exposures are pretty accurate for the most part, but colours can come out distinctly flat, especially on overcast days. The fine detail isn't especially good, either, though to an extent this is typical of cameras with the latest ultra-small 1/2.5-inch sensors (practically every sub 6-megapixel camera these days). The L-500V's average performance means that the only thing to set it apart from its many 5MP compact rivals is that large, high-resolution viewing screen. If this is important to you, then it represents a pretty good buy, but you'll have to remember to set some cash aside for a larger memory card if you want to use it as a viewer for your photo collection as well.